The Black Lion Guest House is family-run business that offers a warm and friendly welcome to all, including cyclists and walkers. Possibly the oldest coaching inn in Wales, the friendly Kings Arms has its own micro brewery and an excellent restaurant serving tapas and à la carte dishes. Standing since at least 1400, the inn still has many original features. We pride ourselves on offering fantastic quality, from the standard of our food and our contemporary boutique bedrooms, to the atmosphere and seclusion of our wonderful gardens. Set at the foot of the Black Mountains, this beautiful 18th century country house presents itself as the ideal base from which to enjoy the wonderful Offa's Dyke trail. 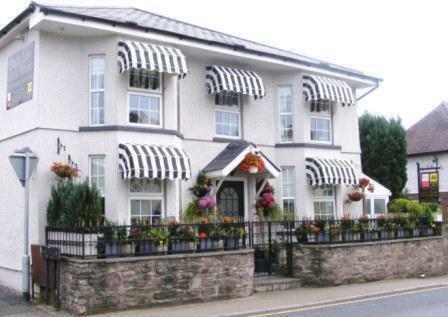 This friendly, family-run bed and breakfast – voted the best in Wales by overseas visitors (2003) – offers picturesque views over the Black Mountains, within the Brecon Beacons National Park. The Lamb & Flag is at the foot of the mighty Sugar Loaf Mountain near the bustling town of Abergavenny, at the gateway to the beautiful Brecon Beacons National Park.